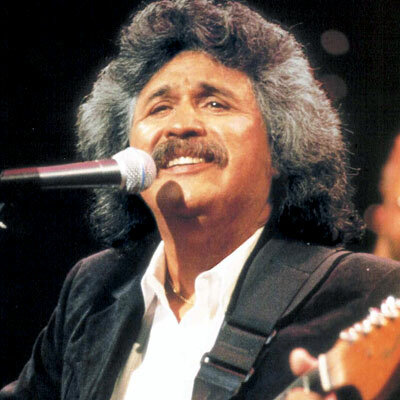 It's just plain ole feel good music... no need to understand the words," I said it years ago and I’ll say it again, "From the heart and desire of Baldemar Huerta, Freddy Fender was born with the talent that has made him a legend." Baldemar G. Huerta was born in south Texas border town of San Benito. He made up his stage name of Freddy Fender in the late fifties because he thought it would help his music, "sell better with gringos". Fender came from the neck of his guitar. "Freddy just sounded good", he notes. In the 1970's, Fender became a member of the Texas Tornadoes and in the 90’s he joined up with Los Super Seven. In 1990, Fender and the Tornadoes were honored with a Grammy for Best Mexican/American Performance. I’m proud to say that this is one gringo who has been a fan of Freddy Fender’s music from the very first time I heard it... and I’ll continue to be a fan no matter what name he is going by or what group he is recording with. God-given talent is not affected by a name change and the breadth and width of Fender’s talent has remained true to the man, his music and his roots. At the age of sixteen he dropped out of high school and joined the Marines for three years. The mid-fifties found him back in San Benito playing in bars and Chicano dances. In 1959 he had his first hit with Wasted Days and Wasted Nights but circumstance and bad luck prevented him from having another hit until the release of "Before the Next Teardrop Falls" in 1974. In April of 1975, "Teardrop" reached Number One on Billboard's pop and country charts. He remade "Wasted Days and Wasted Nights", which quickly became a hit all over again. "Secret Love", and "You'll Lose A Good Thing" also became hits. Billboard named Fender as their "Best Male Artist of 1975" and the Gavin Report honored him with the best single, and the best album, of the year. Finally, after twenty years - Fender was an "over-night success". And, fortunately for music lovers everywhere, the success continues. On his new album La Musica De Baldemar Huerta (in honor of his given name), Fender returns to his roots, recording songs he first heard during his youth in Texas’ Rio Grande Valley. Much care was taken in finding and selecting those traditional Mexican and South American songs that defined "Baldemar" long before he became widely-known through his astonishing career. The album, recorded true to its indigenous, acoustic roots, also includes newly recorded takes of his most enduring #1 hits, "Before The Next Teardrop Falls" and "Secret Love", produced for the first time "en el estilo de Baldemar" (in the style of Baldemar). This delightful, melodic album contains ten songs performed in Spanish, plus a bonus of two of Fender’s mega hits, "Before The Next Teardrop Falls" and "Secret Love". The album should be available in your favorite music store by mid February and you don’t have to understand the words to get lost in the beauty of the music. This one is a major keeper. In this time of world strife and uncertainty, it is comforting to know that some things never change and that true legends do survive. Baldemar Huerta was a true legend.